What inspires me most about Bermuda are the colours. Pantone colour for spring/summer 2016 is Rose Quartz so as a designer I have been obsessed with the colour pink this season. It’s such a great spring shade and in Bermuda it’s everywhere! The houses, the flowers, the beaches, the sunsets and the fashions. There are many talented designers in Bermuda and I wanted to share some of my local favourites… in pink! From pale blush hues to super bright neon’s, the pink spectrum is huge. To keep from going too girly, choose pieces that are sophisticated, not too froufrou. I love the edgy angles of local jeweler Rebecca Little. Bermuda Born’s fun leather bags with pink neon detail feel like butter and are both sophisticated and edgy. You can even smell pink! Lili Bermuda makes a gorgeous romantic floral bouquet composed of Bermuda mimosa, sparkling Clementine, white and pink peonies, and a dash of pink grapefruit. Yum. The Bermuda Candle Company’s hand poured, 100% organic candles will have you dreaming of Bermuda shorts and pink sand when you get home. Speaking of pink sand, visiting Alexandra Mosher’s boutique is a must. 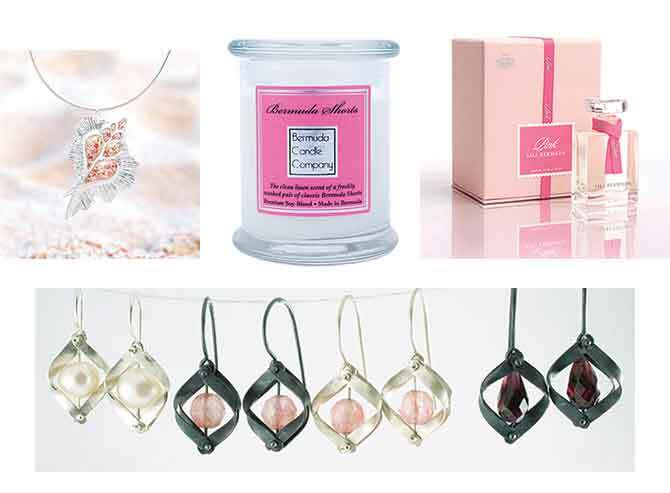 Her award winning pink sand pieces make a wonderful gift or island memento. Not just for the girls. Pink looks great on a man. 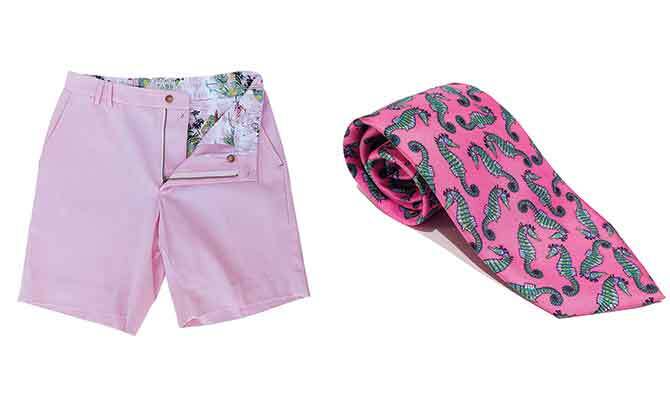 A nice pink tie, shirt, or Bermuda shorts look great this spring. Pink TABS paired with an Island Shop tie, and you’re ready for a drink at the iconic Hamilton Princess. Have fun and experiment with a dash of pink this season with my favorite Bermuda brands that are on trend with this versatile summer hue. All of these are items designed by locals and available on island.